Inspired by Bulhão Pato’s coriander, garlic and shellfish magic, this is a flavourful and delicious approach to serving fish filets. 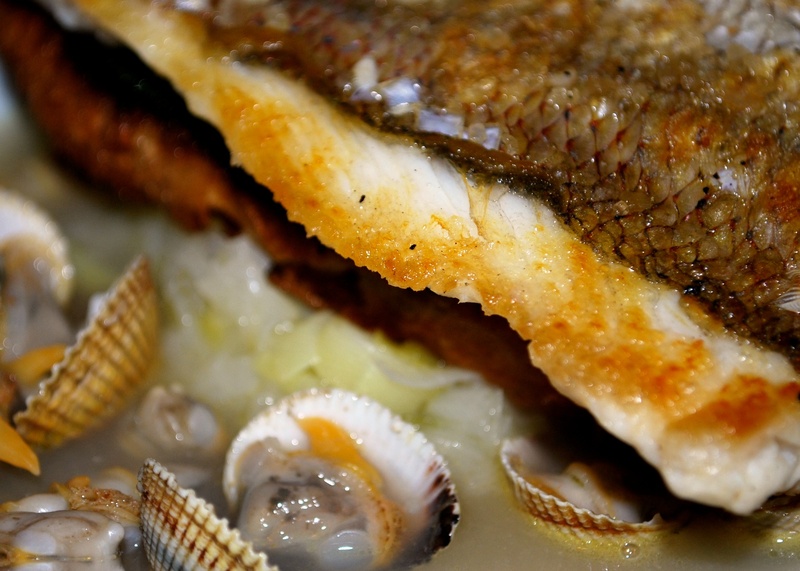 The make or break aspect of this is to get the right flavour balance in the shell fish stock. The method works equally well with fillets of bream or bass. Whole fish grilled over charcoal is a central focus for the 900 km of Portuguese coast. Simply prepared, seasoned with sea salt and grilled to perfection, one hardly needs anything other than a cold bottle of vinho verde! This recipe prepares the fish by opening it across the middle to allow for a larger grilled surface, hence maximising the charcoal flavour. This way of preparing fish makes it easier to grill just the right amount. As your dealing with a relatively thin piece of fish there is no danger of having a burnt skin and a raw middle! This also makes it easier to negotiate your way through the bones as they become more visible with the fish open in half. 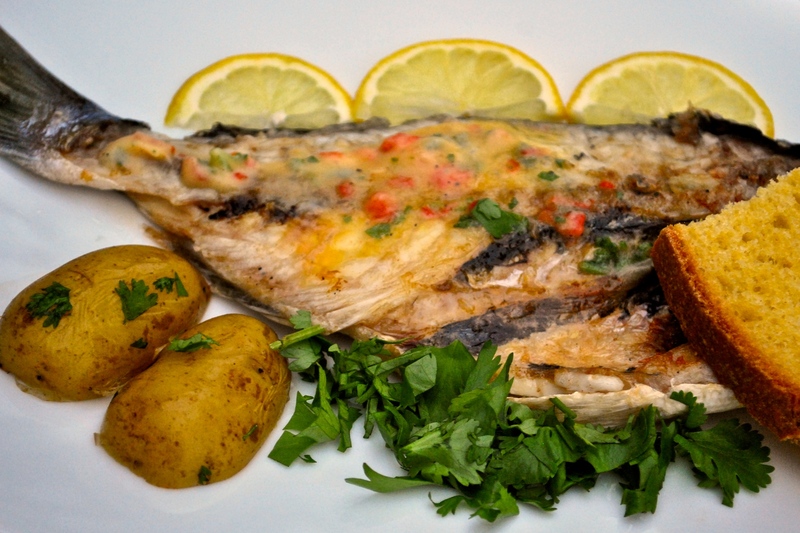 Sea bass and other fish can be prepared in exactly the same way. It is surprising that this south american way of serving fish is not common in Portugal. Fresh fish bought in the market or straight from fishermen is begging to be prepared like this! This is a light citrus marinade of raw fish which makes a tangy, light dish which makes an ideal starter for a richer fish dish or a main meat course. Ceviche is not worth considering unless you’re convinced the fish you’re using is absolutely fresh (i.e pre packed fillets do not qualify). You can ask your fish monger to de-bone/fillet a piece and you’re only left with thinly slicing or chopping it in small cubes. The photograph is a basic ceviche of “cherne” (a much appreciated large white fish in Portugal but constantly mistranslated – if you do know of a good equivalent in English, please let me know). It can be substituted by any meaty fish such as monkfish or tuna.